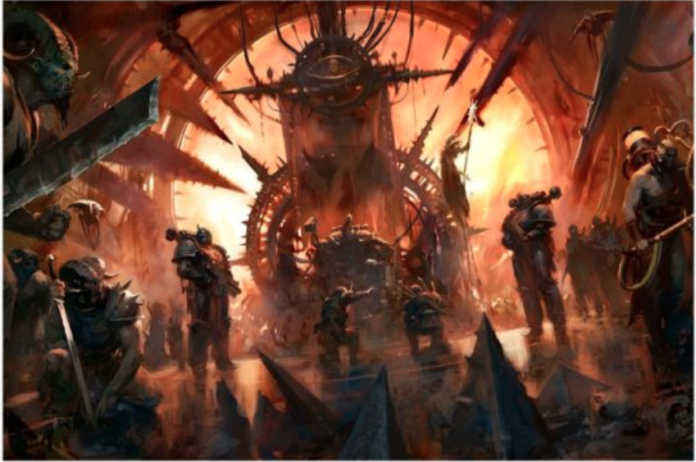 Welcome to Top Warhammer 40K Lists, where we take a look at three lists for a given faction and break down what makes them tick and how they fared. Every entry will be pulled from a recent GT, and we’ll be going over everything from who played the army to how likely the army in question is likely to continue to perform as the game evolves. Today, we’re going to be looking at 3 Chaos lists. Chaos has 4 Codexes at its disposal: Chaos Space Marines, Death Guard, Thousand Sons, and finally Chaos Demons. For tournament submissions, whichever Codex has the biggest detachment is the Codex that the army is counted as. In other words, if a list has 1000 points of Death Guard, 500 of THousand Sons, and 500 of Chaos Demons, it would be listed as a Death Guard list. For shorthand, we would describe that list as “base Death Guard”. Note that if an army has, for example, an 800 point CSM Battalion, a 600 point Demons Spearhead and a 600 point Demons Outrider, it would still be considered base CSM despite the majority of the models being from Chaos Demons. Chaos is one of the most experimental factions at the competitive level. Historically, the army has been played as a strict horde army, usually with lots of Cultists or Plaguebearers and Characters to support the hordes. Recently, these styles of lists have struggled to match the quality of more recent horde armies. As a result, Chaos players are constantly experimenting with abilities and combinations to push the army to the next level. Let’s start by looking at Jim Vesal and his list, who took 1st place at the Dicehammer Warhammer 40K GT in Lake Forest, California. 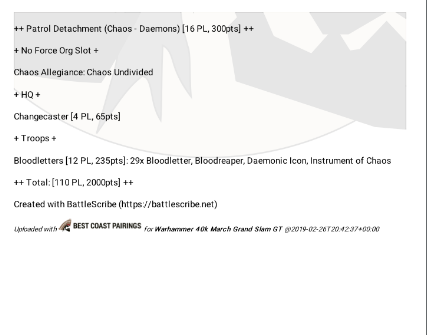 Jim’s list is firmly base Chaos Demons, as they comprise about 1240 points of his list, with the remaining 760 out of Thousand Sons. He took two Battalions and a Supreme Command. First, we have his Nurgle Demons Battalion, comprising of a Poxbringer and a Sloppity Bilepiper, one unit of Nurglings, and two units of 30 Plaguebearers. This is a very straight forward Battalion, relatively speaking. The Poxbringer supports the Plaguebearers psychically, and the Plaguebearers provide great screens and board control. Nurglings give some objective play and interfere with enemy deep strikes, and finally the Bilepiper allows the Plaguebearers to roll 2d6 and pick low for Morale. Not only does this help cut Morale losses, but it increases the odds of rolling a 1 for Morale, which in turn triggers their Icons. Not much to unpack here, it’s just very durable and very efficient. HIs second Battalion is a mixed Demons detachment with a Changecaster, a Khorne Demon Prince with Wings and Axe, 15 Bloodletters, 26 Horrors, and 10 Pairs of Brimstones. The Horrors provide some anti-infantry shooting, and the Bloodletters are a passable melee threat. The Brimstones are extra backfield objective play or screening. Both of the HQ’s here are very critical to this list, however. The Changecaster has Gaze of Fate for providing you with a free re-roll a turn (which is practically +1 CP given how often you re-roll dice), and the Khorne Demon Prince has access to Skullreaver. Thanks to being a Khorne Demon Prince, this guy gets 6 attacks instead of the usual 4. In addition, the weapon has an obscene profile of Strength +3, AP-4, Damage D6, with the ability to re-roll to wound against TITANIC units and the ability to cause D3 Mortals on Wound rolls of 6+. This guy can run over pretty much any heavy target without resistance, and is an all-around great beatstick at 180 points. Finally, we have the Supreme Command of Thousand Sons, comprising of 2 Demon Princes, Ahriman, a Terminator Sorcerer, and finally a Hellforged Contemptor with C-Beam Cannons. The Characters just provide a dizzying amount of psychic support, as you have a grand total of 9 psychic powers off of these 4 models. In addition, each Character is also a potent melee threat in its own right, especially the Demon Princes with Talons. The most interesting inclusion is the Contemptor with C-Beam Cannons. C-Beam Cannons are a weird and somewhat complicated weapon. They effectively lock the Contemptor to hold still, but they have an insane 72” range which means that it’s basically never out of range. The further the target is, the more damage the gun does which mostly cements it as an extra anti-tank piece. 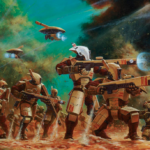 However, if it kills a model it causes 2d6 Strength 6 AP0 Damage 1 hits on the unit, which means that in a pinch the Contemptor can fry 2 Infantry Models and inflict 4D6 (average 14) Strength 6 hits on the unit, which can then pick up a good amount of light infantry. This makes it a deceptively flexible unit, and it’s dirt cheap at 148 points. 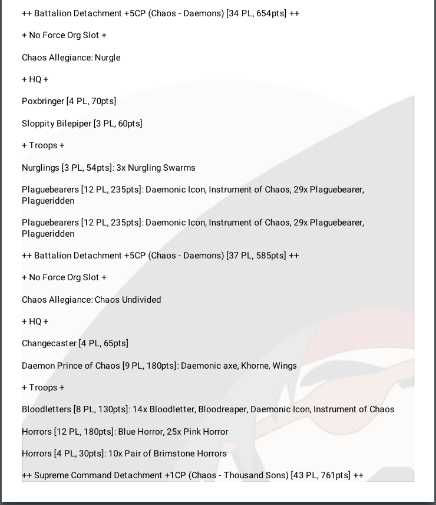 Jim’s list maximizes on a lot of the best strengths Chaos has available: he has tough as nails troops in his Plaguebearers, some of the best Characters in the game in Ahriman and Demon Princes, and a strong offensive bomb to dump CP/Psychic Powers into with his Bloodletters and Horrors, respectively. The only unusual inclusion is the Contemptor, but it’s a nice finish to the rest of the list. You can’t reasonably engage the Contemptor for many turns with all the other threats and issues that are directly in your face, which in turn allows the Contemptor to grind a lot of damage out over many turns. At only 148 points, it’s a very smart choice to round the list out. Let’s move along to our next Chaos list. We have Jason Burau who took 7th in the Desperate Allies GT, located in Conway, Arizona. Jason finished with a respectable 4-1 finish with a base Death Guard army. Jason’s list is oriented around maximizing the many synergies that playing Nurgle brings you. To start him off, we have a Nurgle Demons Battalion with Epidemius, a Poxbringer, a Spoilpox Scrivener, 59 Plaguebearers (he most likely just ran out of points for the 60th), and a squad of Nurglings. For the most part, this Battalion to the last Nurgle Demons Battalion that we looked at with Jim’s list. However, it also includes Epidemius. We’re going to come back to him after we unpack the Death Guard. Speaking of, we have a Death Guard Spearhead. 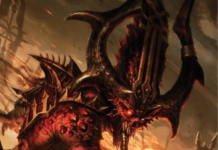 It consists of a Demon Prince with the Arch-Contaminator Warlord Trait, 3 Plagueburst Crawlers, and a Hellforged Leviathan with Dual Butcher Cannon arrays. This is a very simple Spearhead on it’s face, but it’s actually the core of the army. The Demon Prince keeps the PBC’s and Leviathan safe from enemy melee threats while also greatly improving their damage thanks to his base ability to cause models to Re-roll 1’s to hit, and Arch-Contaminator making him broadcast a 6” aura that makes Plague Weapons re-roll all missed Wound rolls, instead of just re-rolling 1’s to wound. This in turn let’s the big guns do their thing and rain down on the enemy. However, there’s another step to this list. 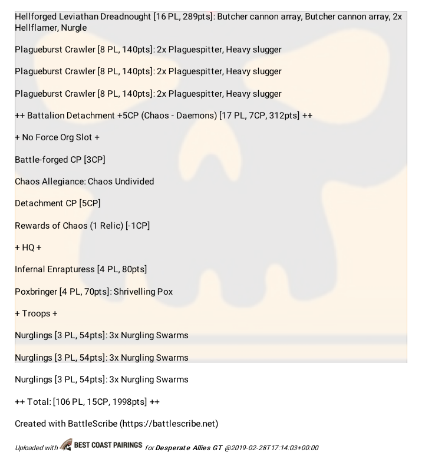 The 3 PBC’s are all Nurgle Demons, which is important for Epidemius. Epidemius has an ability that affects all NURGLE DEMON units, called The Tallyman. Basically, as NURGLE DEMON units start wiping out other units, the Tally grows. The Tally in turn improves the performance of all NURGLE DEMON units on the entire board based on how big the Tally has grown. This means that Epidemius can stand in a corner and start wracking up Tally marks thanks to the Artillery and possibly the Plaguebearers themselves. 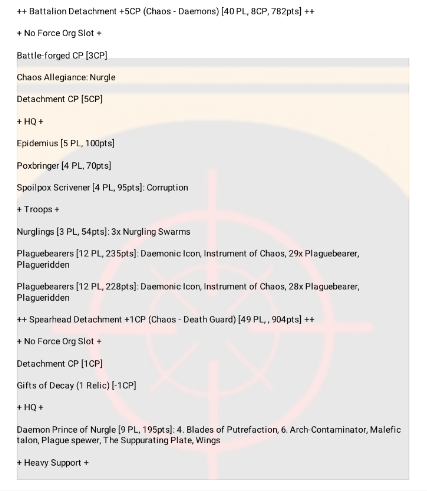 Theoretically, this list can make Plaguebearers become Movement 8, WS3+, Strength 5, Toughness 5, with 2 Attacks and the ability to re-roll 1’s to hit and on their Disgustingly Resilient ability. Alternatively, you can also end up with Toughness 9 Plagueburst Crawlers! Wrapping this list up is the other Battalion, and this is a rather small one. There’s a second Poxbringer, an Infernal Rapturess, and 3 more units of Nurglings. The Nurglings provide objective control and screening, the second Poxbringer has a -1 Toughness power, and the Infernal Rapturess simply messes with the enemy’s ability to cast Psychic Powers. All in all, this is a rather high synergy list looking to leverage Epidemius pretty much to the maximum. What’s really fun about it is that it’s fairly fluffy for a competitive list. There’s definitely something aesthetically pleasing about a bunch of Nurgle Demons and Death Guard rolling across a table wracking up kills for Epidemius to record. Obviously, it also has some serious fangs at the same time which is even better. Let’s move along to our final Chaos list of the day, piloted by Andrew Wilcock at the March Grand Slam GT in Liverpool, England. He took 10th place off his 3-2 record, which although it’s not as high as our other lists, is still respectable. His army was base Black Legion, with some Thousand Sons and Chaos Demons to help back up the Black Legion. Let’s see what he was playing with! Andrew’s list is fairly reminiscent of the meta Chaos lists from about a year ago, as it’s relying on leveraging lots of hordes along with psychic support to push those hordes into obscene power levels. 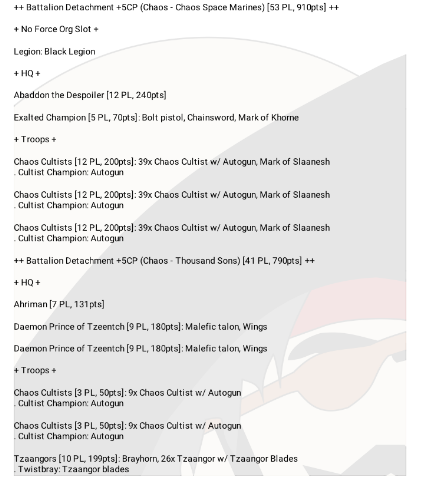 Starting us off, we have his Black Legion Battalion, comprising of Abaddon, a stock Exalted Champion, and 3 units of 40 Slaanesh Cultists with Autoguns. 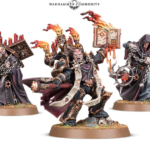 We’ll get to the psychic support later, but already we have the backbone of a strong Black Legion list. Abaddon makes the Cultist’s fearless and allows them to re-roll all missed hits. The Exalted Champion let’s them re-roll to wound in melee, which in turn means that despite being armed with Auto-Guns they’re actually fairly threatening in melee. 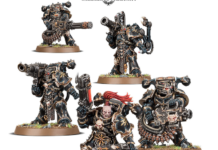 These Cultists can use Veterans Of The Long War along with Endless Cacophony for +1 to Wound and the ability to shoot a second time. That’s a lot of bullets! Next, we have a Battalion of Thousand Sons with Ahriman, 2 Demon Princes, 2 small Cultists Squads, and an almost full unit of Tzaangors. This is where the psychic half of this Chaos list comes in. The Cultists can be moved twice with Warptime while also getting +1 to hit off Prescience. These powers can combine with the Stratagems we already talked about to push one unit of Cultists to a really scary level! Plus, we can use Tide Of Traitors to recover some casualties and re-deploy a unit at the same time. While we have all this Cultist schenanigans going on, we also have a full unit of Tzaangors ready to dive into the fray. These Tzaangors are most likely thrown up board with the Dark Matter Crystal along with a Demon Prince, who in turn can make the Tzaangors have a 4+ Invulnerable Save and make the enemy subtract 1 from their hit rolls against the Tzaangor blob. Even if these guys don’t make melee, they’re going to be a fairly durable brick that needs to be removed. Finally, we have a Demons Patrol with a Changecaster and a Bloodletter bomb. The Changecaster can make the Tzaangors Strength 5 with some careful positioning, which in turn improves their damage against a lot of targets. The Bloodletter Bomb is a basically 100% guaranteed charge out of reserves, as they roll 3d6+1 for their Charge roll. Together, this list is fairly straightforward. You’re trying to apply lots of melee pressure out the gate while your Cultists walk around and shoot everything off board. Since you have around 200 models (most of which are very cheap), you can mostly ignore really heavy hitting units like Knights since you just have more bodies than those models can meaningfully kill. 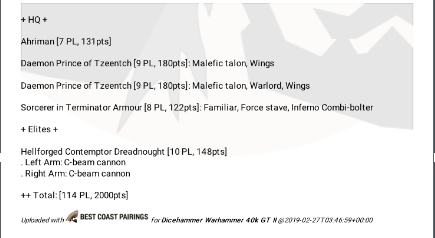 However, this list in particular will really struggle against Custodes since they bring lots of Hurricane Bolters (the bane of any horde list) while also being in a 2+ save. This is part of why most Chaos players have started moving away from lists like this. That wraps us up for today. As we’ve seen, Chaos can be played out of pretty much any Codex and be highly impactful thanks to its plethora of powerful psychic powers and Stratagems. Each list we looked at today was fairly different from each other, and there are many other Chaos lists that are different from what we looked at today. The faction is constantly being theorycrafted and optimized, so it’s the perfect choice for someone who doesn’t want to just follow the meta. With the incredible amount of flexibility the faction has going for it, it will certainly be a mainstay in the future of competitive 40K.